We are pleased to announce the January, 2009 Performancing Theme release: Too Newsy. The Too Newsy Performancing Theme for WordPress is a three-column WordPress theme that uses minimal images and earthy colors, contributing to a touch of elegance. Another highlight of Too Newsy is the use of the sidebar for snippets of the latest posts in a pre-defined category (which is by default the “features” category). This can be useful for bloggers who wish to highlight certain posts, such that they are not pushed down too soon by newer ones. The theme also supports gravatars out of the box. Too Newsy is another collaboration with Splashpress Media designer Sophia Lucero, who previosuly brought us the Rubidious Theme, and various other Splashpress Media blog designs. You would need to make some sidebar edits, either through widgets or on the sidebar.php file itslf. This is particularly for the features column, where you can define a category that will have a few posts as “sticky” on the sidebar. Also, you would need to edit the menu.php file once the theme is installed, so you can define the header and footer links. This menu is actually an unordered list (UL) and you can add or remove items as needed, and as long as the navigation bar does not get too crowded. We’ve received some complaints about the widget-capability of the theme, and apparently there was a small bug in sidebar.php that prevented widgets from properly appearing in sidebar 2. The download files have been updated (below) to fix that. If you’ve already installed Too Newsy, then you can simply replace style.css and sidebar.php. 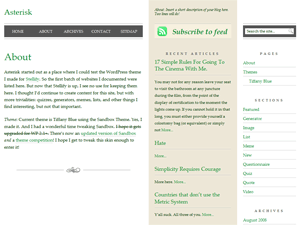 Do note that the widgetized areas appear right below the blurb (for sidebar 1) and right after blogroll (for sidebar 2). See a live theme preview here.